Just over a year ago, we began to make public our family story and journey spanning 25 years now. What is this all about? Our first year, we’ve recounted our individual Perspectives along with some of my personal journey in collecting researching & grieving along the way. Honestly, there are so many layers, textures, tensions, nuances… finding a place to begin was a difficult first step. I’ll never forget the afternoon my husband came home with Frederick Buechnner’s Telling Secrets. My husband had been working with a friend. Somehow they got onto the topic of untimely death and grief. This friend suggested to my husband that I read this book. Over the course of just a couple deep days, I met a kindred mind whose heart inked onto pages and pulsed pain, yes… but beauty and compassion most resounding. Again, over the years, I’m not sure of one writer who has impacted my journey more into the deep. But from that initial reading, I distinctly remember feeling shock & gut-clenching emptiness as he recounted his father’s death when he was just a boy. Due to the nature of the death, young Frederick’s family – not only did they not have any type of funeral or memorial service- they were to speak little of the man again. Immediately, I yearned to run back to 1936– and circle this family up tight. Love on them. Love on them with the wringing of words. You know… Oh, we must talk this out. Get the feelings out, right? Now! What Truth! We recognize it. And if I am honest, I prefer to see & accept the surface of this… the dual between grandeur & gentleness… the myth & the man… the war of the world. Throughout the 25 years of this personal, family loss as well as the writing project, I’ve discovered the deepest well of Hope. The thirst exposing… the thirst quenching kind. Living Hope. I also have discovered some enter & endure life with a toughening up… a fragmenting, maybe. You know, I hurt here, but you’ll never know because I hide it with humor… or hiding myself. Or maybe even relegating hurt to the past and never looking back. Through this journey, I’ve discovered I’m one who has been called into a space of softness … a space I’ve often earnestly resisted. This tension in our times can easily seem off. Something is wrong. Just, generally as a culture we’re more comfortable avoiding the annoying & complaining away the minutely uncomfortable, we’ve no room for the deeper, darker, real & relevant as aspects of the human existence. Those parts that demand an entering into… that entering draws into Eternity while breathing our own moments in history. The Scriptures and the Spirit of the Living God unveiled mighty mysteries to me throughout the journey. The forthcoming series, Remembering to Remember, will unveil more clearly some of the earthy and eternal elements I’m learning along the way. We’ll work through the family Perspectives, some of my more personal wranglings as well as address more of your questions and comments. Thank you for journeying with us. We know how uncomfortable shadows can be. 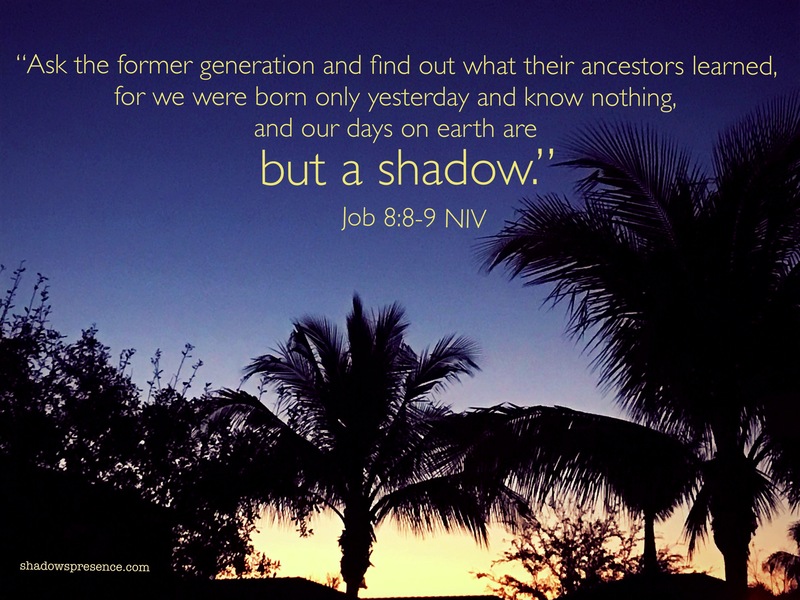 The shadow of death is real; yet, so is the All-Sufficient Shadow of the Almighty. And the chasm between the two… may be a jousting … for minds, hearts, souls, strength, and real community. and it bow down within me. Remembering to Remember is an act of the will. It is not the same as the cliche “getting stuck in the past.” Why? Stuck in the past is passive. Remembering to Remember is active, intentional, and always points to Living Hope. So we invite you to join in our journey of collecting remembrances that root & bloom hope from a hardy, gritty place. How can you join in? – for you to share your own faith stories connecting the earthy tensions with the steadfast love and eternal hope. but daily seeking & finding abundance & leaning in… sharing compassion. Oh, and if you’re just stumbling across this space for the first time, I invite you to check out the following to get to know us a bit. We’d love to get to know you as well.